The images shown below are taken from twww.http://waltonpa.com and is the Walton County Tax Assessors Map showing one of the many areas of dispute within 1 South 19 West. We have added the white wording and lines for comparison purposes. The image below shows the confusion outlined on the 1963 Florida DOT survey. The 2 corners shown were monumented by concrete markers. The GLO used light wood stakes and one was found by the DOT surveyors, but discounted due to its' 488' distance south from one of the concrete markers. Measurements from the GLO field notes support the location of the light wood stake as the true corner location for Section 32. 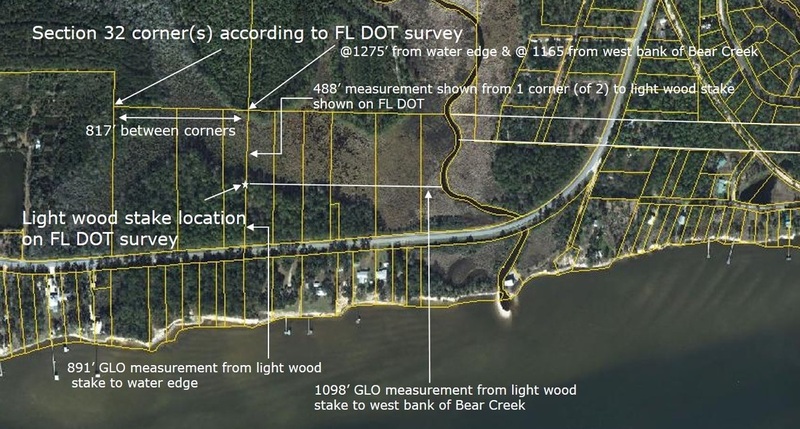 More recent surveys show the light wood stake is missing but the location is still identified by an iron pipe that was next to the stake on the DOT survey. The 817' difference between the 2 concrete markers as the corners for Section 32 represents an 11 acre tract that should be in Section 31 but has been shown in Section 32 since 1888 when a deed from Russell to Caswell for 11 acres west of Bear Creek was conveyed. 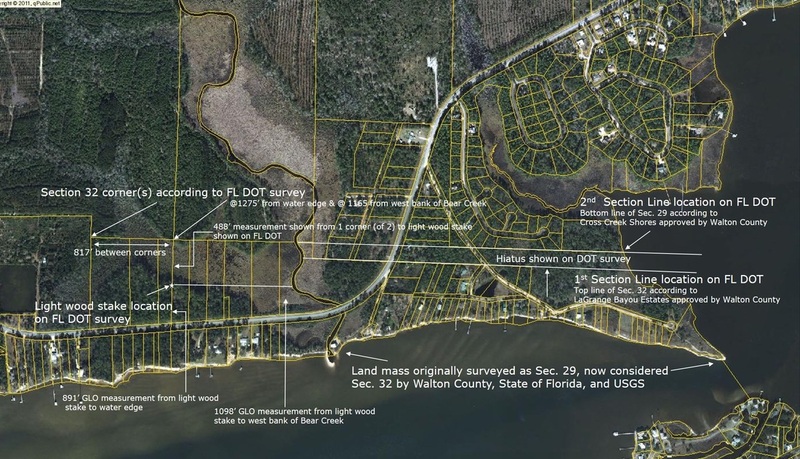 A lawsuit involving the 11 acres occurred in recent history in which the judge was unable to determine which of the two corners is accurate or where exactly the 11 acres is located. The land mass in Section 32 west of Bear Creek has grown from the original 18.5 acres to around 40 acres, with 11 acres that should be in Section 31 and about 10-11 acres that should be in Section 29. The image below shows the land mass originally surveyed by the GLO as part of Section 29. The confusion began in 1890 when a Sheriff’s deed to was issued to McCaskill for 20 acres of land located east of Bear creek and shown in Deed bk 5 pg 275. The land assigned by the Sheriff's Deed is actually in Section 29, and the 20 acres increases over time to around 80 acres in Section 32 east of the creek. The 80 + or - acres actually belong in Section 29.